Brainerd Minnesota, Baxter Minnesota, and the Brainerd Lakes area offers excellent Minnesota Bird Watching opportunities in several scenic locations. The weekly birding report for the Brainerd Lakes area is provided in partnership with Visit Brainerd and local guide Judd Brink owner of MNBirdGuide.com Go birding today and use our new birding kits that are now available for your birding convenience during your stay in the Brainerd Lakes area. Please see the birding kit link on visitbrainerd.com for more information about birding with Judd Brink. 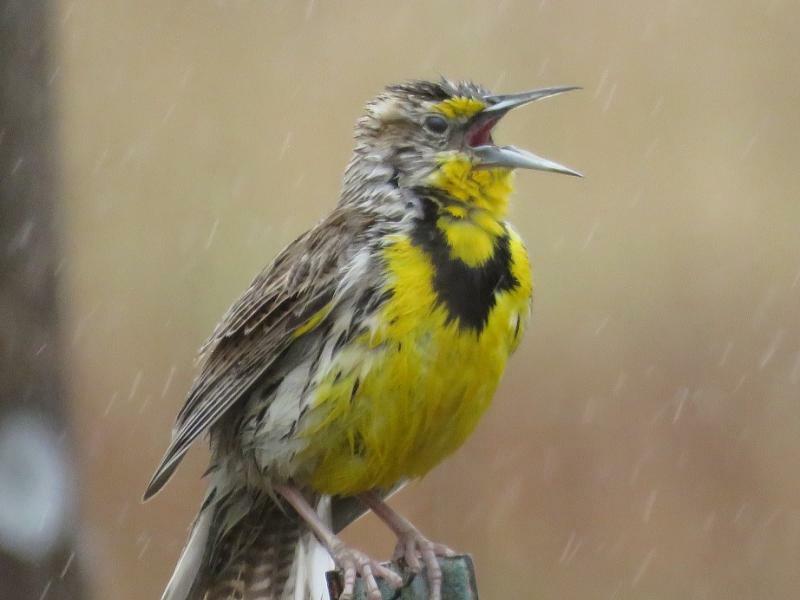 New sightings include; Yellow-headed Blackbird, Chestnut-sided Warbler, Canada Warbler, Scarlet Tanager, Western Tanager, Rose-breasted Grosbeak, Eastern Meadowlark, Black & White Warbler, Ovenbird, Catbird and Golden-winged Warbler. A more detailed report will follow soon. Now heading to the Detroit Lakes Birding Festival! Sometimes while birding you see the unexpected like this coyote. We spotted a Wilson's Snipe in the ditch in the portion of the Brainerd Industrial Park south of Industrial Park Road. A Blackburnian Warbler was spotted near the viewing platform on the Mississippi River downstream from Kiwanis Park. If you have the opportunity it would be a great time to get out looking as the sun comes out and warms up the bugs that warblers and others feed upon. This cool weather has kept all the birds of color at the feeders. Daily, we have at least 3 male scarlet tanagers, two indigo bunting males, a couple of red headed wood peckers and two male Baltimore orioles. Numerous red-breasted grosbeaks. Hummingbirds and the little yellow Pine Warbler. Of course, the females are mixed in, too, but it’s the males that liven up the tree. What is amazing is that all of this color shows up together in the cedar tree and on the feeders at the same time. "This past week, my neighbor and I have had over 200 Pine Siskins feeding on our different bird feeders at different times. I have been going through about 2 gallons plus of Nyjers thistle seed plus other seeds as well a day. The last couple of days the orioles, hummingbirds and Rose Breasted Grosbeaks have returned."